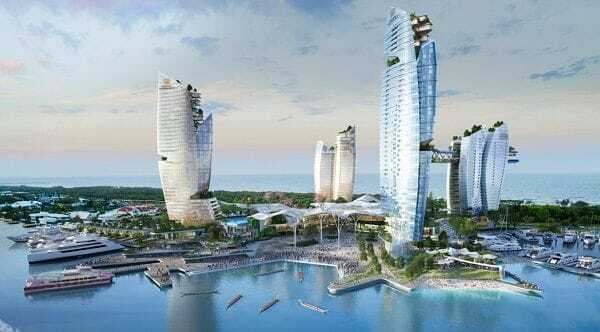 ASF Consortium has revealed the newest addition to its $3 billion Gold Coast integrated resort (GCIR) project, a 6,000sqm beach club in the heart of The Spit. The open-plan venue, inspired by beach clubs in holiday destinations including Florida, Thailand, Dubai and Indonesia, will be able to cater for more than 3,000 guests across a variety of high-class facilities. The development cost is estimated at $30 million, which includes the build of restaurants, cafes, a rooftop lounge and nightclub, outdoor pool and beach area, all surrounded by terraced gardens and lawns. ASF Development Director Dean LaVigne expects the luxury beach club venue will attract world class entertainment, dining, music and art experiences to the Gold Coast. "The Beach Club will be just one of the leisure and entertainment anchors of the GCIR and will rival that of other high-end beach club venues around the globe," says LaVigne. LaVigne says ASF is currently in talks with a number of international beach club brands to take over the operation of the venue once it is built. However, until the project receives planning certainty from the state government, the brands will not be likely to lock in an agreement. "International beach club brands like Nikki Beach, Ku De Ta, Blue Marlin and Purobeach know how to successfully deliver and manage world-class destinations that draw signature chefs, local and international DJs and musicians, whilst also staying true to the local culture and ambience of the location," says LaVigne. LaVigne expects the overall look and feel of the club will be akin to many of the world's most iconic beach venues, complete with poolside sun lounges, beachside cabanas and shaded day beds which will be available for hire during the day and night. He also confirmed that the GCIR will be the first integrated resort development (IRD) in the world to boast its own beach club. "To be the first IRD with a beach club is reflective not only of our premier location but our commitment to build a world-class IRD with a range of attractions and experiences for people from all walks of life," he says. The GCIR project in its entirety has yet to receive the green light from the Queensland government, as its approval is still pending results from the community consultation program which will remain open for contributions until 5pm on Friday 7 April. If the survey yields a positive outcome, construction on the GCIR will likely begin soon after the Commonwealth Games and continue into 2022. If you would like to contribute your thoughts to the consultation, you can complete the survey here.